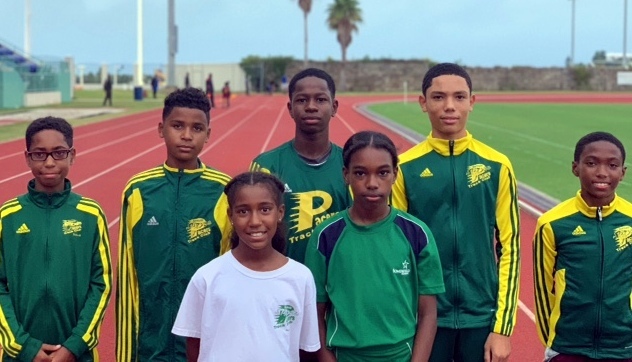 Seven young runners from the Bermuda Pacers Track Club will make history when they become the first athletes in the club to ever compete in the prestigious AAU National Cross-Country Championships. The event will be held on Saturday, December 1, 2018 at Victor Ashe Park in Knoxville, Tennessee. This event attracts over 1,000 athletes from across the US between the ages of 6 to 18 years. Leading the team will be long-distance runner Ryan Outerbridge, who will compete in the 15-16 boys 5K race. Other members of the team are Kahzi Sealey who will compete in the 13-14 Boys 4K race, Jace Donawa, Jaelyn Grant and Maximillian Reid will compete in the 11-12 Boys 3K race. While Jaeda Grant and Ellise Dickinson will compete in the 9-10 Girls 3K race. The team will be accompanied to the event by Pacers’ distance coaches, Jerome Richards and Gina Evans, head coach Cal Simons, club coach Dr. Freddy Evans and parents. “For Outerbridge and Sealey it was an important event as it assists them as they prepare for the 2019 Carifta Games,” continued Simons. Simons also gave credit to club coach Dr. Freddy Evans who was instrumental in making this event happen and the parents for supporting the club and the athletes. Simons concluded, “The team will leave on Thursday, November 29th and return on Sunday, December 2nd.